​Polarized training is not a new training method by any means. And it's not a magic bullet or snake oil, or whatever you want to call it. But, since researchers have started to quantify training intensity distributions of training methods like polarized training it has become possible to scientifically prove what really works best. They have shown that polarized training plans generally outperform other training methods. Like high-intensity interval training (HIIT), threshold-based training, and high-volume low-intensity training. Why polarized training is a smarter way to train for triathletes and endurance athletes who want to improve their performance. Yep, you're right, sounds like a research review! CLICK HERE to get your free sample polarized training plans (beginner, intermediate and advanced versions available) and start reaping the benefits of polarized training. To start off, we need to understand what polarized training really is. In essence, it is just a way of training that results in a polarized distribution of training intensities. That is, most of the training is done at either a low intensity or a high intensity, and not much in between. Polarized training consists of a high percentage of exercise time at low exercise intensity (∼75–80%) accompanied by little time at moderate intensity (∼5–10%) with the remainder spent at high intensity (∼15–20%). Some studies on polarized training have used as much as 90% low-intensity, and just 10% high-intensity training. So the definition of polarized training put simply would be 80-90% of low-intensity training and 10-20% of high intensity training. With potentially just a very small fraction of moderate-intensity training thrown in for good measure. ​Before looking into why you'd want to make your triathlon training polarized (HINT! Because chances are you'll become a better and faster triathlete...), let's talk about how you can go about structuring a polarized triathlon training schedule. I also made three sample training plans (beginner, intermediate and advanced levels) that you can get right here. It all starts by monitoring your training intensities, so you become aware of what you're currently doing. Then you can start making gradual changes, to shift your intensity distribution towards greater polarization. During one typical week of training, use either heart rate or rate of perceived exertion (RPE) to calculate how much time you spend doing low, moderate and high intensity training. Divide these numbers with your total training time for the week to get the percentages for each intensity level. So for example, say you train for 6 hours, and 1 hour is at high-intensity. Then your percentage of training at high intensity is 1/6 = 0.167, or 16.7%. Likewise, if 2 hours is at moderate intensity, that's 33% of your training for the week. And the final 3 hours, or 50% of your weekly volume, would then consist of low intensity training. When you add up the times at different intensities, do it with care, so you don't skew the results. A one-hour track workout with 6 x 3 minutes of hard effort on 2 minute recoveries adds up to 42 minutes of low intensity (warm-up, recoveries and cool-down) and 18 minutes of high intensity. Finally, if you do use heart rate, remember that in workouts like the track workout example above, the heart rate will lag behind the true effort. That is, your heart rate won't rise to a high-intensity level immediately when you start a hard repetition. So in cases like that, you might be better off just going by RPE and the workout structure rather than heart rate. If you use a heart rate monitor, and know your maximum heart rate, you can base your intensity monitoring on that. Training below 80% of your maximum heart rate counts as low intensity. Training at above 88% of your maximum heart rate counts as high intensity. Training between 80% and 88% of maximum heart rate counts as moderate intensity. Training below 95% of your LTHR counts as low intensity. Training above 102% of your LTHR counts as high intensity. 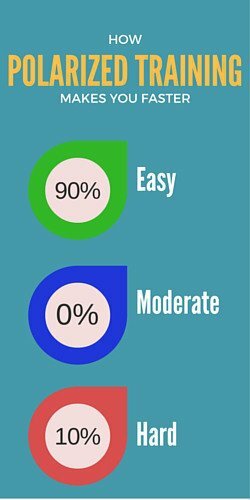 Training between 95% and 102% of your LTHR counts as moderate intensity. Many triathletes, especially beginners, don't use a heart rate monitor in their training. That's perfectly fine, you can still implement a polarized training approach. What you do is to quantify your training intensity based on your rate of perceived exertion, RPE. Training at an RPE of 5 or lower counts as low intensity. Training should be at an RPE of 8 or higher counts as high intensity. Training at an RPE of 6 or 7 counts as moderate intensity. If you're not used to training based on RPE, you can use this table with internal cues and cross-reference with RPE. Using internal cues will help you get the hang of it in no time! Once you've monitored your training and know (at least approximately) your intensity distribution, it's evaluation time. Start by looking at your low-intensity training. If you do less than 70-75% of your training at a low intensity, you should replace some of your moderate or high intensity training with easy and recovery workouts so you get to that range. So, on to the evaluating the high-intensity training. If you do more than 20% of your training at a high intensity, replace that training with low intensity training until you get to within the correct range. Alternatively, for advanced triathletes that don't do much moderate intensity training, you can replace some high intensity training with moderate intensity, as long as the amount of moderate intensity doesn't exceed 10% of your training volume. If ​you do less than 15% of your training at a high intensity, and you don't have a history of injuries or other factors preventing you from training at a high intensity, start to gradually increase the amount of high-intensity training you do, by substituting either moderate intensity training (if you do more than the prescribed amount of that) or low intensity training for it. An increase of high intensity by even just 10-15 minutes per week will get you to the right range pretty quickly, even if you're a high-volume triathlete. Before you're ready to change your training approach, you'll probaly want to see some evidence that polarized training actually works. And as it turns out, there's plenty of that evidence, most of it coming from fairly recent studies (from the past ten years or so). In order to not make this post a full-blown meta-analysis of research on polarized training, let's focus on just one particularly well-designed study. I'll include links to and one-sentence summaries of multiple other studies on the subject for those who want some further reading. Scroll down to "Additional evidence that polarized training works" for that. T﻿he study from 2014 which we'll have a look at here was designed to specifically compare four different training intensity distributions: high-volume low-intensity training (HVLIT), threshold training (THR), high-intensity interval training (HIIT) and polarized training (POL). 48 well-trained runners, cyclists, triathletes, and cross-country skiers​ were randomly assigned to these groups, and they performed training according to the specified intensity distribution over the course of nine weeks. The intensity distribution of each group is shown below (click to zoom). 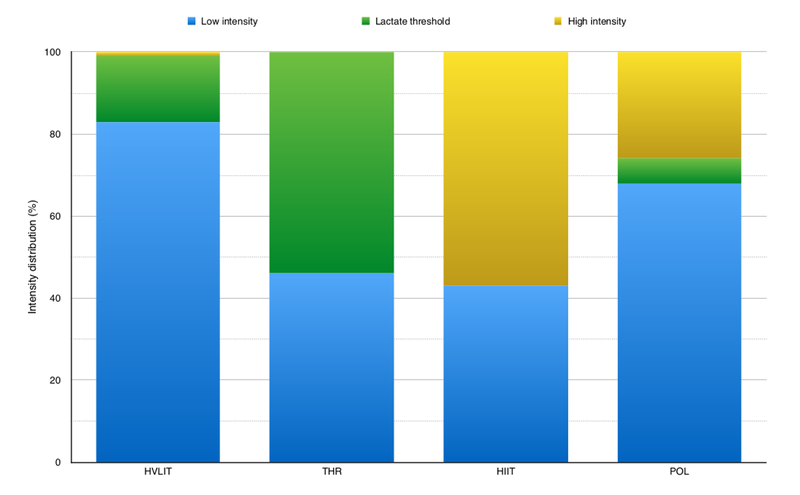 Training intensity distributions of the four groups in the 2014 study. Adapted from Stöggl and Sperlich. Click to zoom. Tests at the beginning and end of the 9-week intervention were used to measure changes in VO2max, running or cycling economy (running or cycling was selected based on the athlete's preference), performance on a time to exhaustion (TTE) test, velocity (running) or power at aerobic (2 mmol/l blood lactate) and anaerobic (4 mmol/l) thresholds, as well as peak velocity or power. For the latter variables, velocity was measured for athletes doing running tests, and power for athletes doing cycling tests. ​The changes from baseline to at the end of the training period in terms of all of these physiological and performance parameters are shown below. Results from the 2014 study. Changes in physiological and performance parameters compared to baseline for each group. Adapted from Stöggl and Sperlich. Click to zoom. In all cases except for economy, polarized training resulted in statistically significantly greater improvements compared to all other groups. 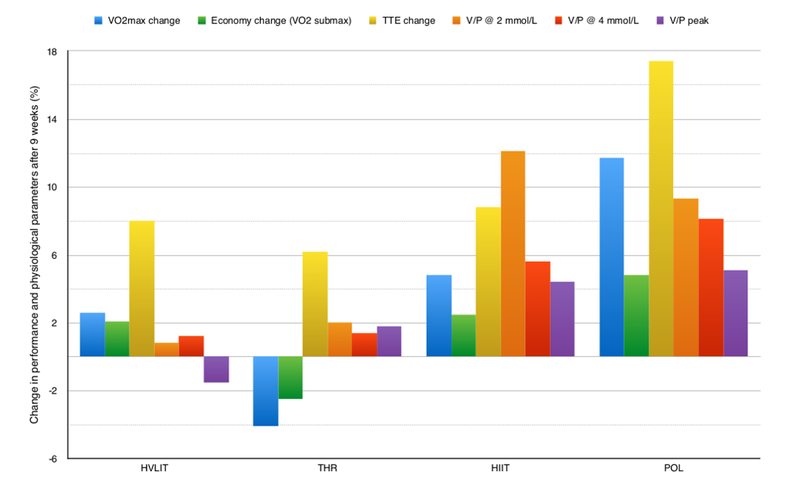 And even for economy, the changes compared to baseline were greatest in the polarized training group. The difference compared to other groups was not big enough to make it statistically significant though. Polarized training resulted in the greatest improvements in most key variables of endurance performance in well-trained endurance athletes. Threshold training or high-volume low-intensity training did not lead to further improvements in performance related variables. Interestingly, the high-volume low-intensity ​and threshold training group experienced either very marginal improvements, or even negative changes in the measured variables. The researchers suggest that this may be due to the fact that the participants were all well-trained and had been involved in endurance sports for many years. And without getting too long-winded, here are the links to and single-sentence (two at most!) summaries of some further reading. Re﻿﻿view article﻿﻿ on polarized training, concluding that for competitive endurance athletes about 80% of training sessions are typically performed at low intensity and about 20% dominated by periods of high-intensity work. 12 well-trained cyclists performed 6 weeks of polarized training and 6 weeks of threshold-focused training, with greater performance benefits resulting from the polarized training. 30 runne﻿r﻿s performed either polarized or threshold-based training for 10 weeks and improvements were measured in a 10k-race. Both groups improved significantly compared to their starting level, but a sub-analysis of the 12 runners who had best managed to stick to the prescribed intensities showed that polarized training was significantly more effective than threshold-based training. Th﻿is stu﻿﻿d﻿y﻿ quantified the training distribution of 12 Norwegian junior cross-country skiers, and found that their intensity distribution was 75% low, 8% moderate and 17% high intensity. T﻿﻿h﻿﻿is study quantified the training distribution of 9 recreational Ironman triathletes, and found that a greater percentage of training done at moderate intensity was strongly correlated with worse performance in the Ironman event they all participated in at the end of the training period. In contrast, more training at a low intensity was correlated with better Ironman performance. This ﻿﻿review article from 2015 concluded that experimental studies lasting 6 weeks to 5 months demonstrate superior responses to polarized training intensity distributions compared to threshold-based approaches. Don't rush head first into a training paradigm like polarized training if it's completely new to you. Make gradual changes towards a more polarized approach, as explained in this post. Also, realize that there is no one-size-fits-all optimal training intensity distribution. This post and the research on polarized training may give you some guidance, but ultimately you'll need to experiment and ideally have a coach help you find out what works best for you. So to sum it up, understand that polarized training isn't gonna be a magic bullet. Realize that it might not work as well for you as for your buddy. Use it as a guidance, and experiment your way to a training intensity distribution that works best for you. Great job on making it all the way through this post. It turned out to be quite a mouthful. As always, sharing this post with all your triathlon buddies is much appreciated. Or just use the social buttons on the right to share directly on social media. If you have any comments or questions, leave a comment below. See you in the next post! Great article, thanks! I have a question: from what I have read, it seems that low intensity is more like up to 70% of maxHR. That at 80% or just below it instead of an Endurance zone (I am a cyclist so I look at the cycling-related info on the net) it is more the beginning of Tempo and the body is switching from fat to glucose burning. Can you comment to clarify? For the individual athlete, at what heart rate you encounter the lactate thresholds (LT1 and LT2) varies. It is quite possible that for most amateur athletes the % of HRmax where this occurs is lower than for the elite athetes that are the subjects of most studies on polarised training. But if you don’t do that, and you’re not a semi-elite athlete, then yes, I would suggest that maybe making your own polarised training zones be below 75% or so of HRmax is a good choice to ensure you’re not training too hard. Thanks, Mikael, of the many polarized training articles that I have read in the past years, yours has been the most straightforward and lucid one! I am forwarding it to a friend. Regarding high intensity training, what you say makes sense. I would like to add this piece of info that may be of help to other readers: Sieler, Scand J Med Sci Sports. 2013 Feb;23(1):74-83. doi: 10.1111/j.1600-0838.2011.01351.x. Epub 2011 Aug 3. He concluded that 4 x 8 minutes high intensity with 2 minutes break each, at 90% max HR was the best approach. Better than longer or shorter interval training. Done twice weekly (I am older, not sure I can do that 2x a week, will see). With 2-3 other long distance low intensity sessions. That’s just 4 days a week training to get some big gains. He concluded “Interval training intensity and accumulated duration interact to influence the adaptive response. Accumulating 32 min of work at 90% HR max induces greater adaptive gains than accumulating 16 min of work at ∼95% HR max despite lower RPE.” (but not more, per the author. 4 x 16 minutes high intervals produced less results). Thank you so much for the feedback and the link to the relevant publication! I’m familiar with that study, as I tend to follow everything that comes out of Norway and the Seiler-corridors very closely, they do such great research there! 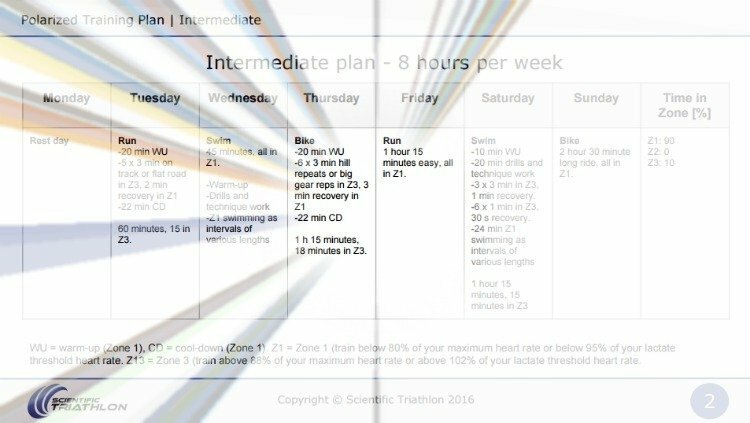 Sample polarized training plans for beginners, intermediate and advanced triathletes. Get the sample training plans FOR FREE! Get your POLARIZED training plan!